Very nice kit, it was easy to build and flies really well. There are only a few things I would do differently if I had to build this again. I would add hatches for the wing servo's and maybe use a little bit thicker balsa for the wing sheeting. I participated in a few pylon races with this EF-1 and it held up perfectly. The only real critisism I have is the construction of the wheelpants. The vacuumformded parts in my kit did not fit together at all so I replaced them with fibreglass pants. 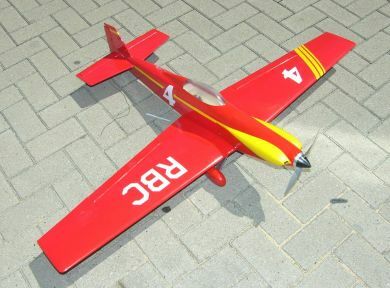 If you like high speed flying an would like to get into pylonracing this is a kit for you! I liked this plane so much that I also bought a Polecat.